Celebrate your big day in a big kind of way with this long tri-folded Kraft Wedding Invitation. This invitation is perfect for a vintage rustic wedding. Its design is simple, yet fun for you and your guests! - 5" X 15" Wedding Invitation- Professionally printed on both sides on a 100lb recycled Kraft Brown cover stock and trifolded to make it a 5" x 5" square. 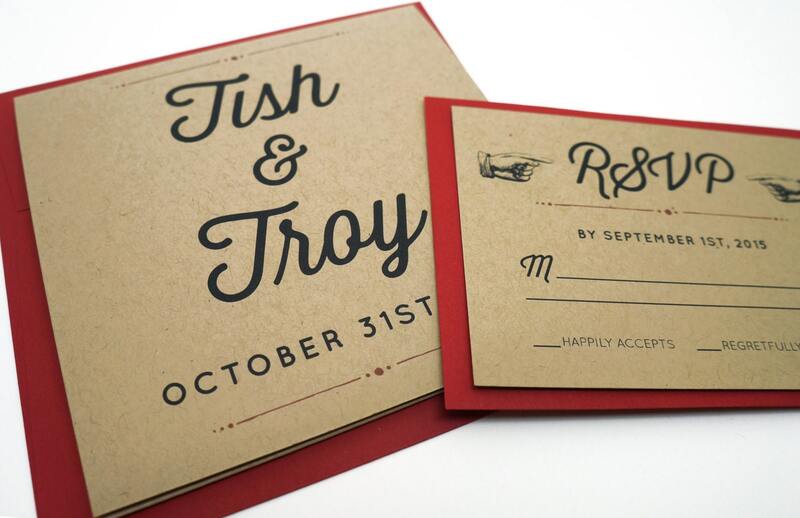 - 3.5" x 4.25" RSVP Card- Printed on the same recycled Kraft Brown cover stock. Bakers Twine = $.25 per invitation, cut to size. Once this information is obtained I will send you a proof (this typically takes between 1-3 days). If interested in purchasing a sample or digital design, please send me a message. All invitations ship USPS 1-3 day Priority. I just received my final product and couldn't be happier. These invitations are exactly what I was looking for, and they look exactly like the proofs. Britt was helpful when we made revisions to our wording, etc. and also made a great recommendation on envelope color. Thank you! Stunning products. Custom order was shipped so quickly! I ordered 2 sets of stickers as well as greeting cards. The result was beyond my imagination and superior to the product photos. The real life results make my corporate gifts look so beautiful!